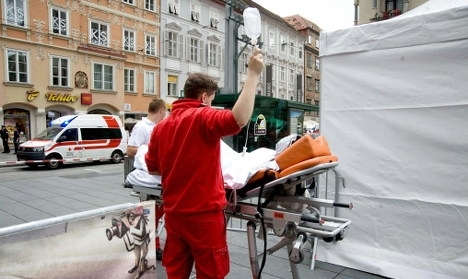 A witness told the Wiener Zeitung newspaper that dead bodies were left lying face down in the street after the vehicle sped through the historic Herrengasse and Hauptplatz in Graz, Austria’s second-largest city, at a speed of over 100 kilometres (60 miles) per hour. 34 pedestrians were injured during the episode – ten of them seriously, with six people reported to be in a critical condition. According to a police spokesman, the suspect has “no connection with fanaticism and no terrorist background.” It is believed the man was suffering from personal problems and he has been described as “mentally imbalanced”. The Austria Press Agency cited a police source as saying the driver showed symptoms of “psychosis”. Witnesses told the Kronen Zeitung that he was “laughing” as he accelerated the car, and that he deliberately drove into pedestrians. “People were screaming in panic and ran into shops to get to safety,” an eyewitness said. The city’s mayor, Siegfried Nagl, personally witnessed the incident and told the Kleine Zeitung newspaper that he saw a woman being run over. Austrian President Heinz Fischer said he was “deeply shocked” by the attack.